This novel was recommended to me by my favorite reader's advisory librarian who knows I don't like time travel fiction as a rule (Time Traveller's Wife, I'm looking at you), but who told me I would enjoy this novel. And I did. In a near future Massachusetts, MIT grad student Matt Fuller sees the calibrator he's been monitoring disappear and, in the blink of an eye, reappear. Thinking he's imagining things (his boss certainly thinks so), Matt takes the calibrator and runs some small experiments on it. Not surprisingly, Matt isn't delusional -- he has created (or stumbled upon) a time machine. Dum Dum Dum. After losing his job, girlfriend, and any motivation to go on in this timeline, Matt modifies the calibrator to send himself forward in time. And then again. And again. 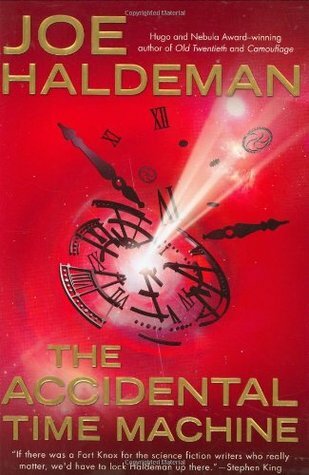 Haldeman's treatment of time travel was, I thought, quite well done but remember I don't like time travel books so ymmv. Each future Matt visited was just a little more interesting (and just a little bit nastier) than the previous one and I found I really wanted to know what new fresh hell lay around the bend. Indeed, some of the futures were so interesting I almost wished Matt hadn't pushed the button to go on! That said, Matt himself was not the most endearing of characters and I had a hard time caring whether he ever went back in time or not (Martha's love for him redeemed Matt somewhat, but I'm still not sure what Martha loved in him). "Don't you remember what Emerson says -- Melton's always quoting it -- 'Most of our expense is for conformity to men's ideas? It's for cake that the average man runs debt.' He must have everything that anyone else has, whether he wants it or not. A house ever so much bigger finer than he needs, with ever so many more things it than belong there. He must keep his wife idle and card-playing because other men's wives are. He must have his children do what everyone else's children do, whether it's bad for their characters or not. Ah! the children! That's the worst of it all! To bring them up so that these complications will be essentials of life to them! To teach them that health and peace of mind are not too high a price for a woman to pay for what is called social distinction, and that a man must -- if he can get it in no other way -- pay his self respect and the life of his individuality for what is called success --"
He broke off to say gloomily: "The devil of it is that we don't decide anything. We just slide along thinking of something else. If people would only give, just once in their lives, the same amount of serious reflection to what they want to get out of life that they give to the question of what they want to get out of a two weeks' vacation, there aren't many folks -- yes, even here in Endbury that seems so harmless to you because it's so familiar -- who wouldn't be horrified at the aimless procession of their busy days and the trivial false standards they subscribe to with their blood and sweat." I've slowly been reading my way through Dorothy Canfield Fisher's novels this winter. A committed educational reformer and social activist, Canfield Fisher wrote with a deep, clear morality I find very appealing. Indeed, I find her novels to be so beautifully crafted and thought-provoking that I cannot believe they are not more widely read! If you're interested in reading her novels, the young adult novel Understood Betsy is an excellent place to start. I also strongly recommend the coming-of-age novel The Bent Twig. While it's quite a lot longer and deals with darker topics, there's no doubting Betsy and Sylvia are sisters of a kind. Returning to England after a long stay in Australia, Kendra Tamale hopes her new flat is the perfect place to rebuild her life -- a quiet, tranquil, solitary place where she could spend time licking her wounds and getting herself back together. Alas, it seems her landlord's children have other plans! The children, Jaxon and Summer, keep coming to Kendra for help and attention. Soon she is drawn, unwillingly but necessarily, into their lives and their parents' relationship drama. While the novel looks fluffy, it tackles some pretty dark and serious issues -- abuse, infertility, adultery, separation, alcoholism. Koomson approaches them with great sensitively and intelligence and I found myself pretty much cheering at the end. A less skilled writer might have gone for an obliviously happy ending, but Kooomson went with the one that was best for her characters. It's the right ending even if it lacks Romance. My only complaint lies not with the novel, but with its American cover art. Kendra is black and the woman on the cover (what can be seen of her, anyway) is the same color as the (white) child next to her. Race isn't an issue in the novel, but the whitewashing of the cover has made it one for me because I can't understand why the publisher would have done this. It's essentially the same cover as the UK edition -- just whiter. Wtf? 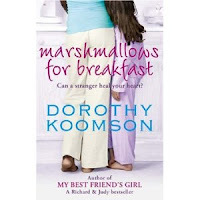 Cover art aside, I thought Marshmallows for Breakfast made an excellent afternoon's read and I look forward to reading Koomson's recent novel, The Ice Cream Girls. The March family are impoverished, humanitarian vampires living in New England during the Civil War. Mr. March, a chaplain in the Union Army is away from home, and Mrs. March does her best to contrive a happy home for her four daughters and send them down a life-path which will turn them into "little vampire women." I must admit that while I have watched several film versions of Little Women, I have never managed to read the novel in its entirety. However, when I saw the cover of Little Vampire Women with its pale, blood-covered young women, I immediately thought that this might be a version of Little Women I could stand to read. Surely it would avoid the mawkish qualities that drove me from the original novel? Well, yes, and no. Yes, there's lots of blood, vampire defender training, and slaying of vampire hunters, but there's also plenty of sweet rhapsody over the perfection of "Dear Marmee," Beth's possession of Mr Laurence, Meg's courtship and marriage to Mr Brook, and a million other things that most girlish readers would enjoy. But I didn't. Much of the novel felt as Little Women had felt when I tried to read it all those years ago -- preachy and kind of smarmy in its sweetness. I feel I should mention that Little Women is the only Alcott novel I don't get on with. Little Men was one of my favorite childhood reads and I adored her semi-autobiographical novel, Work: A Story of Experience, when I read it last April. Miss Judith Hearne is a woman of a certain age living in 1950s Belfast. 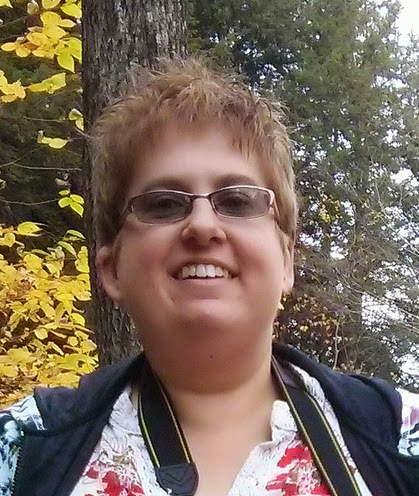 She has fallen rather far from her "proper" social circle and has neither the money nor the looks to get back up. She also lacks useful or necessary skills suiting to the working class environment she finds herself in and clearly knows this but does not see what she can do about it. Judith lives a life of quiet despair and desperation. Always feeling watched by others -- especially God and her dead aunt -- she longs to live a life full of goodness, but cannot quite attain it. Which is entirely her fault, of course. She is full of sin, after all. Full of "sinful evil thoughts, sins of intent. Denying God." Is it any wonder then that she has a (she thinks) secret love for drink? Or, when the best hopes she has for her future are utterly crushed and she is left humiliated, she goes a bit cream crackers? Moore's skill with language and the deftness with which he manipulates his characters made The Lonely Passion of Judith Hearne a real pleasure to read. Yes, the subject he writes about are rather terrible ones and there was little about Judith that didn't make me cringe, but it was also all so real.